This is the City Publishing Group homepage, running XHTML driven Wordpress 3.3. I'm an excellent writer and possess the ability to weave ideas from one paragraph to the next in a style that's easy to read and very informative. 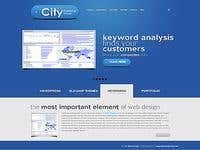 I'm an expert Wordpress developer/engineer with 5 years experience. I'm fluent in HTML & CSS. I love web graphics and have 10k plus hours working within the Adobe Photoshop environment. View a combined example of my work here [login to view URL] - I created that website from scratch using Photoshop and Wordpress CMS and am responsible for 99% of all textual content. DCX represents a political niche website which caters to that market. The views expressed in no way reflect my personal political affiliations.